So you’ve been eating an apple a day to keep the doctor away. Well I’m not here to tell you that apples aren’t healthy, cause they definitely are. However… Did you know that there’s a dark side to this juicy snack? Too much of a good thing is never good most times, and the apple is no exception. THAT’s right, the apple, although extremely good for you in certain respects is not immune to scrutiny. In fact, an apple can be very harmful to your teeth if not eaten correctly. You see apples are extremely acidic. 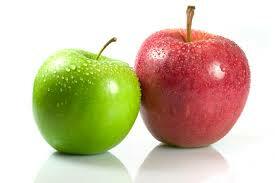 in fact, a study published in the Journal of Dentistry, said that apples may be even more acidic than soda. Eat your apple with another snack. Maybe eat a small serving of cheese, glass of milk, or crackers along with it. Foods like these will help neutralize the acid in the apple – especially if they’re high in calcium. Rinse with a glass of water. A glass of water never hurts and as a bonus it helps rinse away acid and food particles that have collected between your teeth. Wait to brush. Brushing immediately after eating any sugary food is not a good idea. The sugar will act like sandpaper and damage your tooth enamel (that’s the hard, outer surface layer of your teeth that serves to protect against tooth decay.) Wait at least 30 minutes after sugary snacks to brush. Hopefully you found this info helpful, because if you were anything like me back in the day, you may have thought eating an apple was a great substitute for brushing your teeth. I’m here to tell you it MOST definitely is not. Thanks for reading, and as always keep healthy!